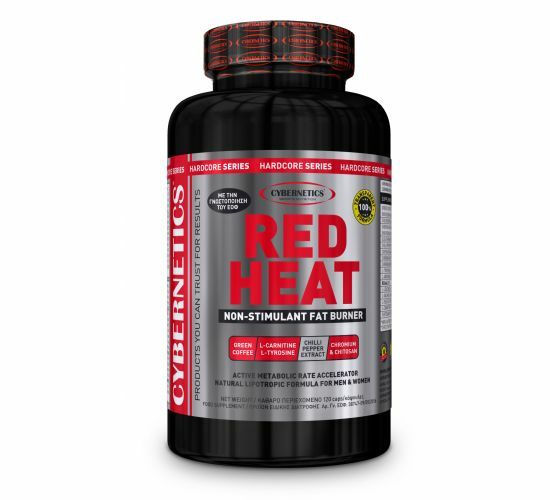 Lipotropic formula RED HEAT is a unique combination of non-stimulant ingredients that reduces appetite and calories intake and assists in weight and stored body fat loss. Lipotropic formula RED HEAT contains the most effective natural ingredients that demonstrably reduce the rate at which fat isstored into cells and accelerate the rate of fat disposal from the body during ametabolic process. Ingredients such as carnitine, tyrosine and chromium, help to increase the conversion of stored body fat into energy, while assisting in the regulation of blood sugar in order to impede sudden changes in its levels so that the desire for something sweet is not increased. Green coffee, along with a high content in chlorogenic acid, increases the body's ability to oxidize fat and helps to increase energy and mental focus during training. Lipotropic formula RED HEAT contains chitosan, a natural fat tier rich in chitin, which has the ability to attract and binddietary fats, making them non-absorbable and eliminating them from the body. Further more,lipotropic formula RED HEAT contains BCAA amino acids and l-arginine, which support lean muscle mass and ensure a smooth and fast metabolic function so the body does not "stop" and keep son burning fat. So if you have some extra weight and want to lose it as soon as possible, it's time to try the most effective lipotropic supplement of the market that acts smoothly and safely, without causing the feeling of anxiety and stress and without affecting thyroid and cardio vascular system’s function. The solution to a natural weight loss is one: RED HEAT! !